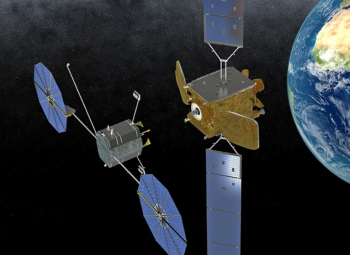 International Launch Services (ILS) is continuing to plan out its future manifest by announcing two new missions via the signing of launch services contracts. The missions both involve EUTELSAT birds, via the first use of a first commercial contract incorporating the use of the newly announced Proton Medium rocket and the first commercial shared launch using a Proton Breeze M with the EUTELSAT 5 West B satellite and MEV-1. Both missions are included under the Multi-Launch Agreement (MLA) announced by ILS – in cooperation with EUTELSAT – in October of last year. The MLA was designed to provide EUTELSAT with “schedule flexibility and assured access to space at cost effective prices over a seven-year period”. 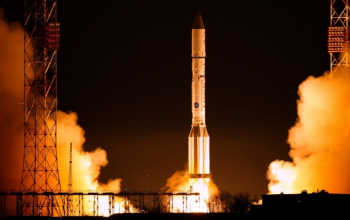 The first mission launched under the MLA was the Proton-M launch of the Eutelsat 9B satellite on January 30, 2016. Adding to its range of mission capabilities, the Proton Medium vehicle was introduced last month, along with the Proton Light vehicle, during World Satellite Business Week in Paris. This introduction allows ILS to provide launch options to customers who would normally go to companies such as Arianespace, who have the Ariane 5, Soyuz and Vega launchers. The Proton vehicles are a product line extension of the commercial Proton Breeze M designed to expand the Proton addressable GEO market with competitive launch solutions in the small and medium satellite class range (3 to 5 metric tons). The light and medium vehicles are two-stage versions of the Proton Breeze M launch system developed for exclusive commercial use by ILS. However, the first mission, set to launch late in 2018, will be the joint launch of the EUTELSAT 5 West B satellite and MEV-1. EUTELSAT 5 West B is another telecommunications satellite, built on Orbital ATK’s GEOstar satellite platform, with a payload built by Airbus Defence and Space. This satellite is a key stablemate of the satellites launching under the MLA deal between the launch services company and the satellite operator. The Orbital ATK MEV-1 (Mission Extension Vehicle-1) spacecraft will be riding as the lower passenger during this launch. 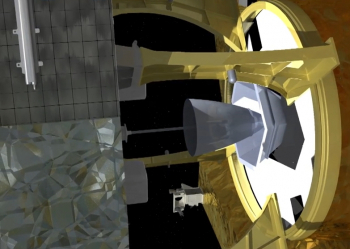 This spacecraft will be testing life extension services for satellites in orbit. Orbital ATK is manufacturing and testing what is the first Commercial Servicing Vehicle (CSV). After successfully completing a series of in-orbit tests, the MEV-1 will begin its mission extension service in 2019. 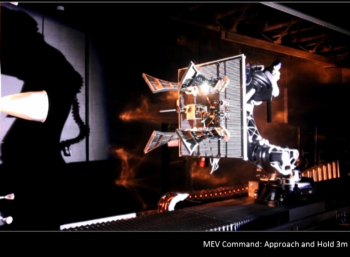 Based on its own GEOStar spacecraft bus platform, MEV-1 utilizes a reliable, low-risk docking system that attaches to existing features on a customer’s satellite. The MEV-1 provides life-extending services by taking over the propulsion and attitude control functions. Satellites have an average of 15 years of life on orbit, before they need to be replaced. The vehicle itself has a 15-year design life with the ability to perform numerous dockings and undockings during its life span. The launch of MEV-1 will involve in-orbit testing and a demonstration to be performed with an Intelsat satellite. MEV-1 will then relocate to the Intelsat satellite scheduled for the mission extension service, which is planned for a five-year period. 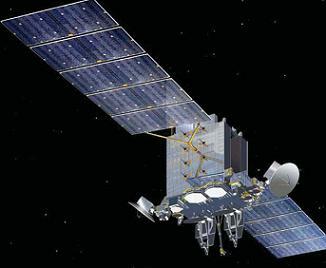 Intelsat will also have the option to service multiple satellites using the same MEV. “We are delighted to partner with Intelsat to introduce this innovative new service to the commercial satellite market,” added David W. Thompson, Orbital ATK’s President and Chief Executive Officer. “The MEV-1 demonstrates the combined capabilities of Orbital ATK following the merger of our two legacy companies. 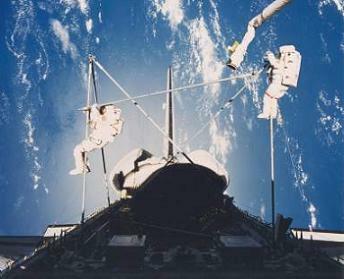 However, a more innovative, cheaper and safer option for aiding malfunctioning or aging satellites is the MEV concept. This enables mission extension for satellites that have run out of maneuvering fuel yet still have healthy payload and power systems. Despite a nominal launch atop of an Atlas V in August, 2010, a failure of the satellite’s subsystem resulted in the AEHF-1’s hydrazine-fueled liquid apogee engine (LAE) failing to carry out the required burns to place it correctly into Geostationary Orbit. Thanks to some clever work via the satellite’s United States Air Force controllers and AEHF-1 teams, the $2 billion bird was saved via the ingenious use of the two smaller engines – namely the hydrazine-fueled Reaction Engine Assemblies (REAs) and later by the xenon-fueled Hall Current Thrusters (HCTs) – despite their primary role being one of positional stability on orbit. Orbital ATK’s Space Systems Division had already completed two prototype docking mechanisms that will reinforce the MEVs ongoing development back in 2013 as part of the path towards the in-space test. According to the company, these prototypes demonstrate servicing capabilities to potential clients and will be used to validate contact dynamics and docking performance in the Orbital ATK RPO (Robitics) lab. 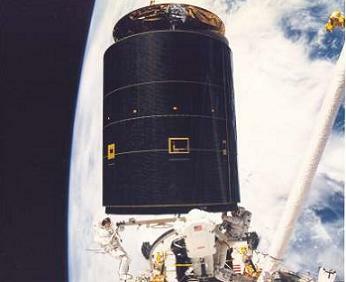 ATK also completed initial testing of closed loop proximity operations, demonstrating the ability to track a simulated host satellite using a prototype visual sensor suite.